Next Generation Asset Integrity Management (AIM) solution now available for the shipping and offshore industries to reduce the CAPEX and OPEX exposure of operators. Neuilly-sur-Seine, France, April 20, 2017 - Veristar AIM3D is the evolution of Bureau Veritas' Asset Integrity Management services. Based on Dassault Systèmes 3DEXPERIENCE platform, the new solution combines a digital twin of any marine or offshore assets with smart data in a collaborative environment. Veristar AIM3D is conceived to be used from the design stage, through construction, and throughout the operational lifecycle, to reflect and predict the condition of any asset, or fleet of assets. The solution supports risk based inspection and condition based maintenance approaches. Veristar AIM3D provides asset management dashboards for individual ships, rigs or facilities - or for entire fleets. This will enable smarter decisions based on better visibility of actual asset condition and performance. This will reduce costs during operations and provide return of experience data to better inform design and construction, so helping address the twin challenges of reducing both CAPEX and OPEX. "This technology is taking the industry forward, connecting surveyors, drones, experts with data through mobile applications, cloud based systems and enterprise software solutions, all to reduce risk and to improve safety and financial performance", commented Matthieu de Tugny, COO, Bureau Veritas Marine & Offshore. With this solution Bureau Veritas is also addressing the challenge of fragmented IT environments. 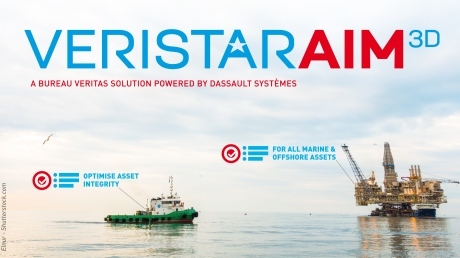 Veristar AIM3D is asset adaptable and, while offshore operators were the primary market for the investment, the solution is suitable for operators and fleet managers of conventional ships: particularly, if classification requirements, as well as shipmanagement systems, are integrated. Before construction, during the design stages, plan approval on 3D models can be carried out directly with designers. These can then be used throughout an asset's life with the new service creating a reliable, single source of truth for better decision making about actual and future asset condition. "Bureau Veritas continues to leap forward with new products and services that leverage digital technology to address operators' safety, quality and reliability challenges," said Alain Houard, Vice President, Marine & Offshore Industry, Dassault Systèmes. “The 3DEXPERIENCE platform connects assets, data and people in a unified digital environment that enables Bureau Veritas to improve the asset integrity management experience for its customers." Bureau Veritas' solution bridges the gap between available technology and industry needs, enhancing safety, risk and operational management to move beyond traditional reporting structures. When used to its full potential Veristar AIM3D could lead to a complete change in how inspection, maintenance and repair activities are prepared and reported. Data, presented in concise dashboards, will be immediately available to all stakeholders having access to the asset Veristar AIM3D platform. Accumulated data across assets types and through life should enable a combination of predictive responses and a feed back into better designs. Future development of the solution, by collaboration between BV's technology partner (Dassault Systèmes) and clients, will help meet specific and evolving requirements in a virtuous circle of continual improvement, feedback and refinement.